Whether iced tea is your beverage of choice or you're looking for an alternative to soda, an iced team maker is a great addition to the kitchen. The ReviewLab team has performed extensive research on iced tea makers to help you make an informed purchase decision. You’ll find detailed information on electric iced tea makers, iced tea makers that include fruit infusers and models that also make iced coffee. Each iced tea maker on our list includes its top features, specifications and other considerations. Read more about our methodology. The Takeya Flash Chill Iced Tea Maker is a great overall choice for quickly and easily brewing fresh, cold tea. With the fine mesh infuser, you can enjoy your favorite tea, using either bags or loose leaf. The Tea Forte Tea Steeping Pitcher set is both stylish and functional. It comes with two pitchers, one for steeping and one for chilling. And you'll also get a sample pack of teas to get you started. This is a great choice for anyone in the market for an iced tea maker. The Zenco Pitcher Infuser set is an excellent low-cost choice to make your favorite tea, either hot or cold. The glass pitcher is durable and will be an attractive addition to your kitchen. The Wintergreen Iced Coffee Maker and Tea Infuser is a great choice to satisfy both the tea and coffee drinkers in your household without breaking the bank. This attractive, dishwasher-safe model uses the cold brew method to make up to 48 ounces iced tea and iced coffee. 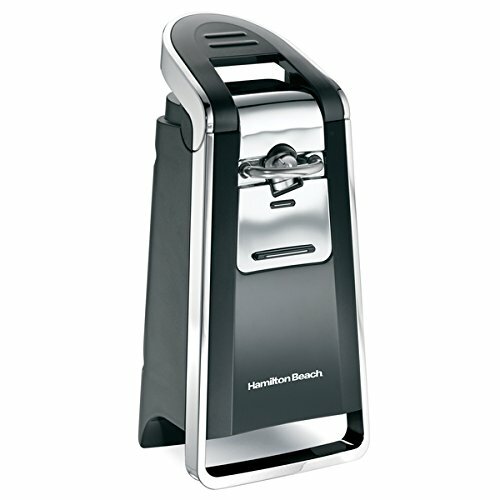 The Hamilton Beach 40911 is a great choice to easily and quickly brew your favorite iced tea. The 40911 is designed to brew tea directly into a pitcher of ice, so you have two quarts (eight cups) of cold tea in minutes. The Mr. Coffee TM70 is another great choice for an electric iced tea maker. You can brew your favorite tea, using either bags or loose leaf tea. The plastic, BPA-free pitcher makes three quarts of tea in minutes. 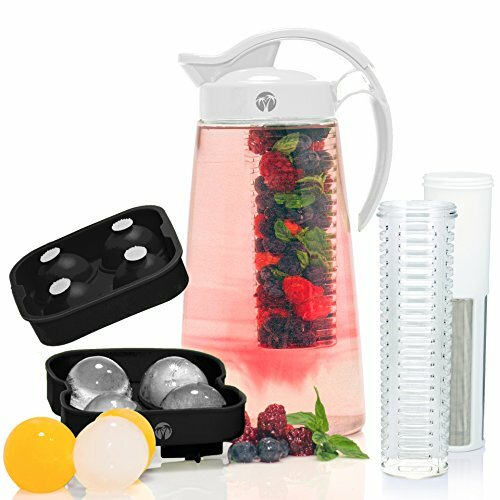 The Mami Wata Infusion Pitcher is loaded with extras to help you brew the best fruit-flavored tea. The stainless steel infuser and thick, BPA-free plastic pitcher are durable and dishwasher safe. The One Plus One Fruit Infusion Pitcher is a great choice for cold brew coffee and teas or for adding fresh fruit flavor to your water. And you’ll enjoy serving drinks to your guests — and yourself — in the attractive glass pitcher. 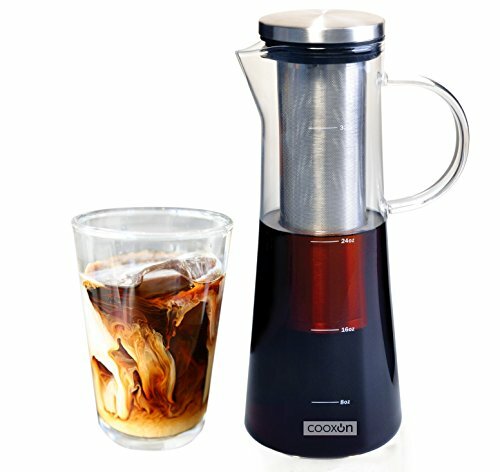 The Cooxon Cold Brew Coffee Maker and Tea Infuser is a great choice if you want to brew coffee and tea, hot or cold. The pitcher is made from durable, heat-resistant borosilicate glass, and the stainless steel filter makes cleanup easy. The Zenzenze Iced Coffee Maker and Tea Infuser cold brews 50 ounces (just over eight cups) of delicious tea or coffee with lower acidity and tannins. And the attractive carafe can also be used to decant wine or hold other beverages. You should consider which type of iced tea maker best fits your needs. With electric iced tea makers, you can quickly and easily brew your tea. However, some models are not dishwasher safe. Flash-chill models are simple to use and quickly cool down your tea, but ice cubes are required. There are also different styles of pitchers, such as ones with handles, carafes, double-walled for better insulation, and glass or plastic (check for BPA-free material). Some models are designed to only brew tea, using either tea bags or loose leaf tea. Other iced tea makers include a fruit infuser for adding fresh fruit flavor to a pitcher of tea or water. If you’re also a coffee drinker, or have tea and coffee drinkers in your household, a combination iced tea and iced coffee maker is a great choice. There are also models that can either hot or cold brew the tea or coffee. You should also consider how much and how often you drink your beverage. Iced tea makers are available in different sizes, typically one, two or three-quart capacity. Most models have pitchers that will fit in the refrigerator. But not all pitchers have lids, and the lids on those that do may be more airtight than others, allowing the tea to stay fresher longer. You can buy a simple iced tea maker for under $20. These models typically have an infuser in which you place your tea bags or loose leaf tea, and the infuser drops into the provided pitcher. For $20 to $50, you’ll find iced tea makers that may include a fruit infuser and/or are also capable of making iced coffee. Electric iced tea makers can run anywhere from $25 up to $165, depending on the styling, materials and features, such as automatic shut-off and brew-strength selector. The Takeya Flash Chill Iced Tea Maker is an excellent choice to enjoy all your favorite teas, whether you use tea bags or loose leaf. This Takeya model will brew and chill one quart of tea in minutes. Simply boil water, steep the tea in the infuser/pitcher, remove the infuser and add ice to the pitcher. The pitcher conveniently fits on the refrigerator door, and the airtight lid will keep your tea fresh for days. Styling. The Takeya Flash Chill Iced Tea Maker’s slim design and handle make this model easy to work with. Some users comment on the convenience of the flash-chill method, which makes the iced tea in minutes. The pitcher is made of BPA-free plastic so no harmful chemicals will leach into your tea. The airtight lid keeps your tea fresh holds in all the tea flavor and antioxidants. And the lid and handle come in four colors to match your kitchen décor. Tea bags or loose leaf tea. This Takeya model has a fine mesh infuser that allows you to use tea bags or loose leaf tea without ending up with floating particles in your chilled tea. Easy storage. The pitcher is the size of a quart of milk, so it will easily fit in your refrigerator on a shelf or on the door. The airtight lid also allows you to lay the container on its side. And the lid will keep your tea fresh for days. Capacity. The Takeya Flash Chill Iced Tea Maker brews one quart (four cups) of iced tea, and several users wish it had a larger capacity. 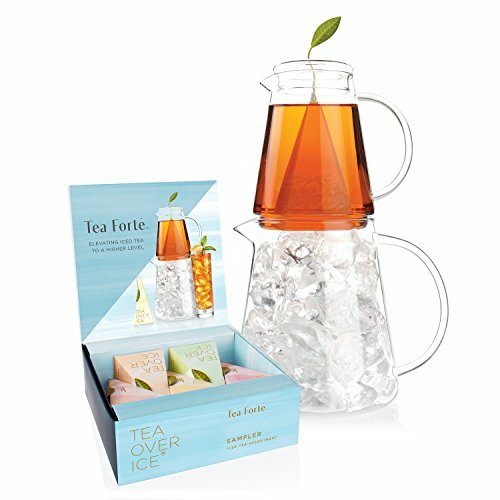 Freshly made iced tea has the best flavor, and the Tea Forte Tea Pitcher set uses flash chilling so you can drink your tea minutes after its brewed. The two glass pitchers that come with your purchase make a dramatic presentation when they’re stacked together: one for steeping and the other for flash chilling the brewed tea. This Tea Forte model is an excellent choice for iced tea drinkers. Attractive styling. Several users comment that the styling of the two glass pitchers makes for an appealing presentation. The tea steeps in one pitcher that sits on top of the second, ice-filled pitcher. 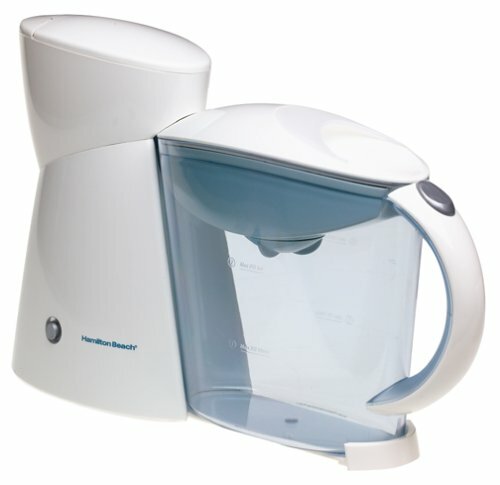 You then pour the brewed tea into the second pitcher, which flash chills it, creating fresh, iced tea in just minutes. Use Tea Forte’s infusers or your own tea bags. You can use any bagged tea that you like. But many users comment that they continue to buy Tea Forte’s infusers not only because they find the tea delicious, but they say the infuser’s pyramid shape looks attractive in the glass pitcher. Extras included. In addition to two attractive glass pitchers, the Tea Forte Tea Pitcher set includes a sampler of various teas to get you started. Capacity. 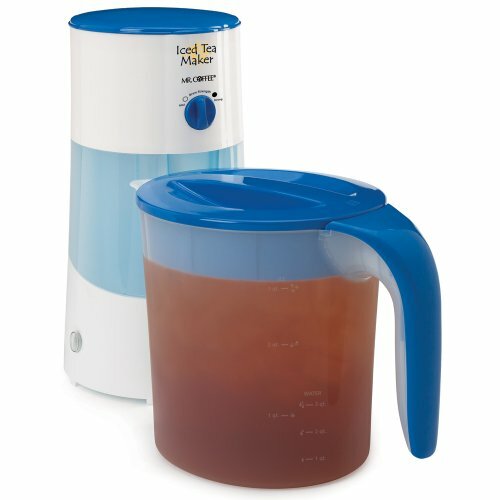 This Tea Forte model makes 24 ounces (three cups) of iced tea; some reviewers say they wish the pitcher was larger. Tea bags only. With this model, you can’t use loose leaf tea unless you purchase a separate tea infuser spoon or another type of reusable infuser. With the Zenco Pitcher Infuser set, you have the choice to brew your favorite teas hot or cold. The attractive, lightweight pitcher is made from durable borosilicate glass, which has excellent thermal shock resistance. The stainless steel infuser makes it easy to brew a pot of tea either from bags or loose leaf, and the flip lid lets you pour tea with only one hand. These features and others make the affordable Zenco Pitcher Infuser set a great choice. Cold or hot brew. With the Zenco Pitcher Infuser set you have the choice to brew your tea hot or cold. Hot brewing is the quicker method, and you can drink your tea hot or make iced tea in minutes by adding ice to the hot beverage. Cold brewing takes longer, but some say this method results in a smoother brew. Durable materials. The Zenco Glass Teapot is not only attractive, but also durable. It’s made from borosilicate glass, which scientists use in their labs because its lightweight and has excellent heat resistance. The stainless steel infuser has a mesh fine enough to let you brew any loose leaf tea. And the infuser is removable, so you can also use tea bags or a blooming tea ball. Ergonomic design. 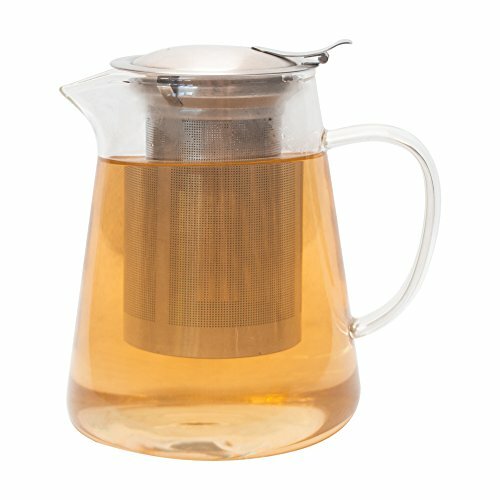 Though the Zenco teapot holds 32 ounces of tea, the lightweight borosilicate glass makes it easy to lift. And the flip lid with a thumb tab lets you pour your tea with one hand. Even when hot water is in the pitcher, the handle remains cool to the touch. 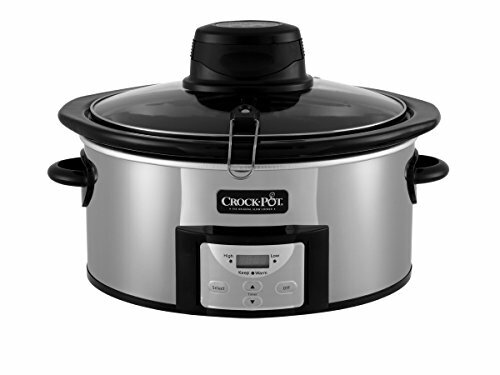 Many reviewers comment this model is easy to use and a snap to clean. Infuser length. A few users wish the infuser extended further into the pitcher. The Wintergreen Iced Coffee Maker and Tea Infuser is a great choice for the budget-minded shopper. The large, 48-ounce pitcher is made of durable glass and stainless steel and is dishwasher safe. This Wintergreen model brews your iced tea and iced coffee using the cold brew method, which many say results in lower acidity and less bitter taste in your brewed beverage. The pitcher easily fits in your refrigerator, so you can keep your beverage fresh for days. Make iced tea or iced coffee. With this Wintergreen model, you can make tea and coffee. And the cold brew method is a great choice if you’re affected by the acid and tannins in coffee and tea, or you dislike the bitterness that’s often in these beverages. Several studies have shown that cold brewing tea and coffee results in these beverages having lower levels of acidity, bitterness and tannins. Several users comment that they notice less acid with this Wintergreen cold brew model. Durable and dishwasher safe. The pitcher in which the tea and coffee are brewed is made of extra-thick glass and stainless steel, making this model not only attractive, but durable. And this model is safe to put in the dishwasher. Large capacity. This Wintergreen model has a capacity of 48 ounces, which is larger than comparable models by two or more cups. Still, the pitcher is shorter than a quart of milk, so it will easily fit in your refrigerator, where the tea or coffee will stay fresh for up to 14 days. Infuser mesh could be tighter. A few users say that loose tea or finely ground coffee can seep through the mesh filter in the infuser. 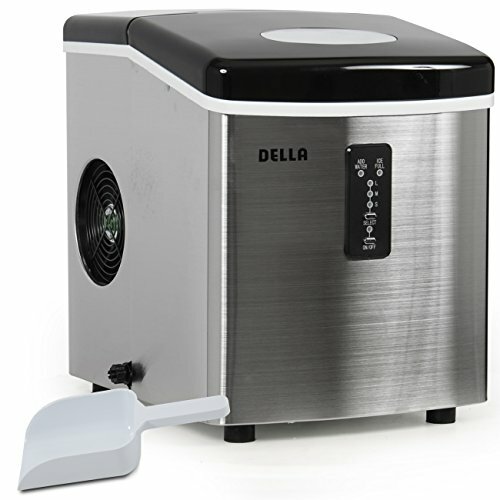 Electric iced tea makers are a fast and easy way to prepare batches tea. Some electric models include an adjustable brew-strength selector, so you can make teas to suit your taste. Pitchers typically can be removed from the electrical component to store brewed tea in the refrigerator. The Hamilton Beach 40911 brews a two-quart pitcher of iced tea in minutes. The 40911 is designed like a coffee maker, and just as easy to use. Though the pitcher holds two quarts (eight cups) of tea, its slim shape makes it easy to store in your refrigerator on a shelf or on the door. With other features such as a brew-strength selector and an automatic shutoff, the Hamilton Beach 40911 is an excellent choice if you’re shopping for an electric iced tea maker. Fast and easy to use. The Hamilton Beach 40911's design and ease of use are similar to those of a drip coffee maker: Simply add tea, water and ice and select your brew strength. 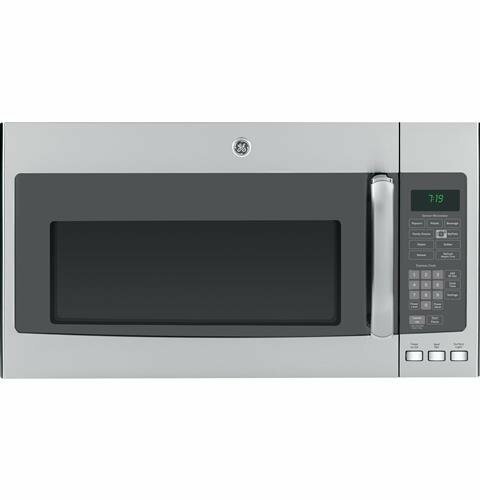 The unit shuts off automatically when brewing is complete. Many reviewers comment on how easy this iced tea maker is to use. Large capacity and storage. The 40911 has a large two-quart (eight cups) capacity. And the pitcher is designed with a slim profile so it will easily fit in your refrigerator, either on a shelf or on the door. Use tea bags or loose leaf tea. Whether you use tea bags or loose leaf tea, you can brew your favorite tea in the Hamilton Beach 40911. And this model has a convenient, easy-to-clean paperless filter. High price. This model’s price is at the high end of electric iced tea makers. Not dishwasher safe. Components of the Hamilton Beach 40911 must be washed by hand. Mr. Coffee has brought their expertise with coffee makers to iced tea, and their TM70 model is an excellent, affordable choice if you’re looking for an electric iced tea maker. This easy-to-use unit includes some great features such as a brew strength selector, a reservoir water window and a non-drip spout. With the Mr. Coffee TM70, you can brew your favorite iced tea using tea bags or loose leaf tea in minutes. And with this model, you can also make iced coffee. Takes bags, loose leaf tea and coffee. With the TM70, you can use tea bags or loose leaf tea. You can also brew iced coffee with this model. Easy to use features. 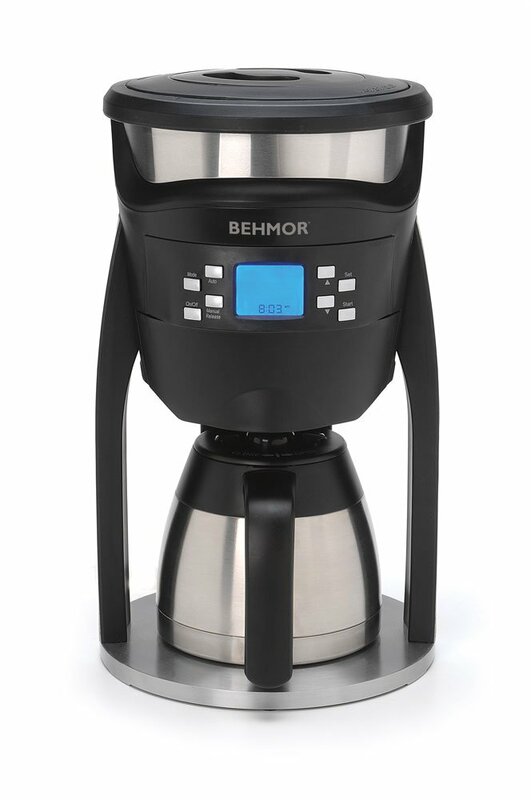 The Mr. Coffee TM70 includes a brew strength selector, a window in the water reservoir, an on/off button with a power indicator light and auto shut-off. The BPA-free plastic pitcher is marked with one, two and three-quart levels for water, and separate levels for ice. To brew the tea, you simply add tea to the brew basket, fill the pitcher with water to your desired level, pour the water into the reservoir, add ice to the pitcher at the appropriate level, and brew. The pitcher, pitcher lid and brew basket are all dishwasher safe. Capacity and storage. The Mr. Coffee TM70 has a large three quart (12-cup) capacity. And the pitcher stores easily in refrigerators. Possible stains on pitcher. A few users say the plastic pitcher developed tea stains after a period of use. If you’re looking to add a bit more flavor to your refreshing drink, an iced tea maker with a fruit infuser is a great choice. With these models, you can add fruit flavor to black, green or herbal tea. You also can use these iced tea makers to infuse plain water with fruit flavors. The Mami Wata Infusion Pitcher is a great choice for iced tea drinkers or anyone looking for an alternative to sugary sodas. With this model, you can also brew hot tea or infuse your water with fresh fruit flavor. The Mami Wata pitcher comes with two infusers: a stainless steel one for brewing tea with either bags or loose leaf and a BPA-free plastic one that holds fresh fruit to make flavored water. Other fun extras include an ice ball maker and a recipe booklet. Variety of uses. You can use this product to make hot or iced tea with either tea bags or loose leaf tea. There’s also an infuser in which you add fresh fruit to add flavor to a pitcher of tea or water. Durable materials. The pitcher for this Mami Wata model is made from Tritan, a tough, BPA-free plastic that’s heat resistant and shatterproof. The fruit infuser is also made with BPA-free plastic, and the tea infuser has a stainless steel filter. All these parts are dishwasher safe. Capacity and storage. The Mami Wata Fruit & Tea Infusion Water Pitcher holds two liters of beverage (eight to nine cups) and will fit on your refrigerator door. Includes extras. Your purchase includes an ice ball maker, which can also be used to make round fruit pops. After buying the Mami Wata, they will email you an ebook with recipes. Several users comment on how much they like these recipes. Poor instructions. A few reviewers say the instructions were not very informative. 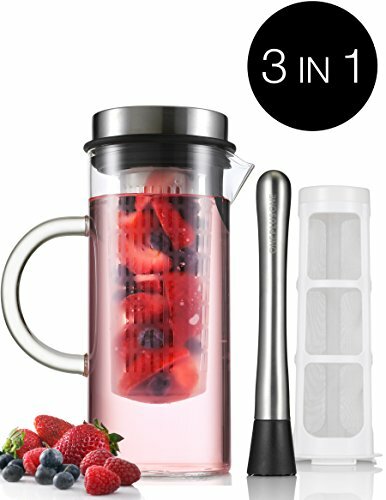 The One Plus One Fruit Infusion Pitcher is a three-in-one beverage maker. You can make iced tea with bags or loose leaf, brew coffee and infuse drinking water with the flavor of fresh fruit. The sleek, contemporary-style pitcher is made from durable borosilicate glass. Whether you’re looking for alternatives to sugary sodas or a quick way to brew your favorite cold beverage, the One Plus One Fruit Infusion Pitcher, Iced Tea and Iced Coffee Maker is a great choice. Multiple uses. This product comes with two infusers: one with a fine-mesh filter for cold brewing coffee and tea bags or loose leaf tea, and another that holds fresh fruit for flavoring your drinking water. Also included with your purchase is a stainless steel muddler to get the most flavor from the added fruit. Durable material. The One Plus One Infusion pitcher is made from borosilicate glass, which is more durable and breaks less easily than regular glass. It’s also not affected by acids and tannins from coffee, citrus and tea. Many users comment on the attractive styling of the pitcher. Storage. 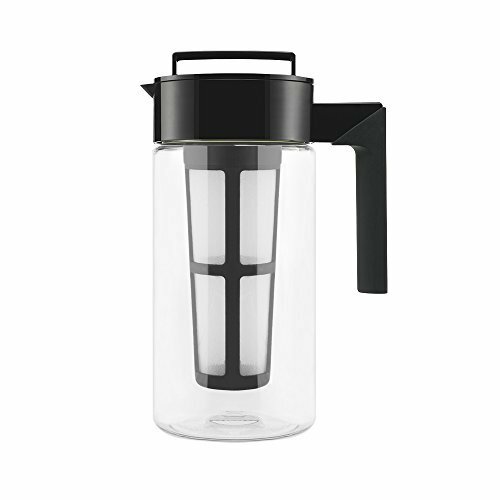 The One Plus One Fruit Infusion Pitcher, Iced Tea and Iced Coffee Maker has a stainless steel lid that creates an airtight seal so your beverage stays fresh longer. The slim pitcher will fit in your refrigerator on a shelf or on the door. Capacity. Several users say they wish the pitcher, which holds 32 ounces (four cups) of beverage, was larger. Combination iced tea and iced coffee makers give you more beverage choices. These versatile machines let you to brew your favorite tea or make your own cold coffee brew. 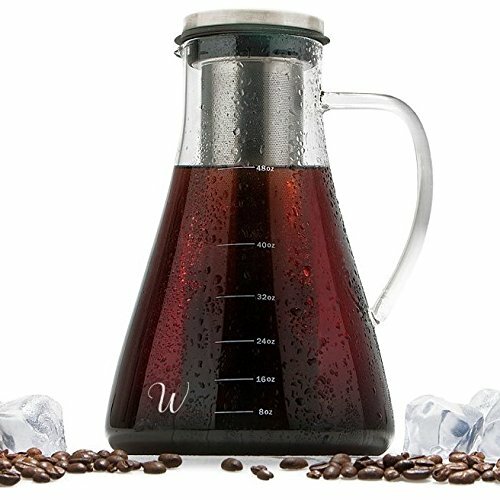 Cold brewing reduces tannins and acid, and the Cooxon Cold Brew Coffee Maker and Tea Infuser makes 32 ounces of rich, smooth-tasting tea and coffee. The stainless steel filter allows you to use your favorite loose leaf tea or ground coffee, and the airtight lid will keep your brews fresh longer. With the durable borosilicate glass pitcher, you can also safely brew hot coffee and tea, making this an excellent choice for all tea and coffee drinkers. Makes tea and coffee, hot and cold. With this Cooxon model, you can brew hot or cold coffee or tea. And you can use your favorite tea bags or loose leaf tea; no paper filters are needed. Cold brew coffee has been shown to have lower acidity, and several users comment on the smoother, purer taste of their coffee. Durable materials. 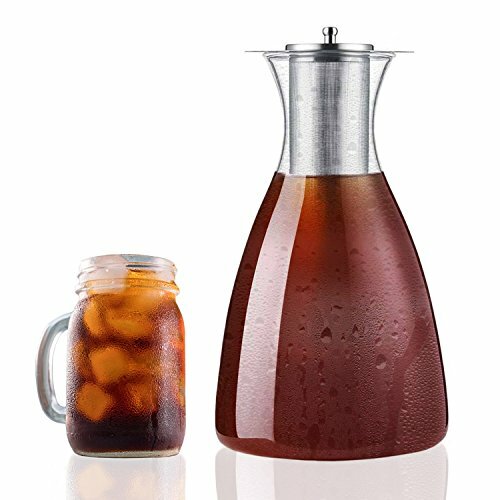 The pitcher for the Cooxon Cold Brew Coffee Maker and Tea Infuser is made from borosilicate glass, more durable and heat resistant than regular glass, making it safe to brew your hot beverages. 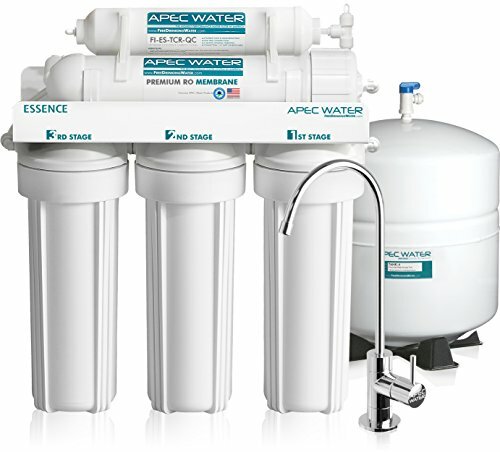 The filter is manufactured with long-lasting stainless steel, and the silicon seal on the lid is BPA free. Storage. This Cooxon model will fit in your refrigerator and the airtight lid will keep your beverages fresh for days. Recipe ebook included. Along with your purchase, you can download the Cooxon recipe book to get the most out of your pitcher. Poor instructions. A few reviewers say the instructions are vague and don’t provide enough information, especially for brewing the coffee. With the Zenzenze Iced Coffee Maker and Tea Infuser, you can brew iced coffee and tea using the cold brew method, which has been shown to produce these beverages with lower acidity and tannins. The Zenzenze model is simple to use and easy to clean, and all components are dishwasher safe. If you’re affected by high acidity in your coffee or tannins in tea, or if you simply love a smooth-tasting beverage, the Zenzenze Iced Coffee Maker and Tea Infuser is a great choice. Cold brew method. Rather than starting with hot coffee and tea, this Zenzenze model makes iced coffee and iced tea using the cold brew method. Studies have shown that using this method reduces acidity in coffee significantly, and reduces the taste of tannins in tea while also retaining helpful antioxidants present in many teas. Large capacity. The Zenzenze Iced Coffee Maker and Tea Infuser has a large capacity of 50 ounces (just over eight cups), which is more than many other iced tea makers. The carafe still fits in your refrigerator to keep any leftovers fresh for days. Easy to use and clean. This Zenzenze model is simple to use: Pour water into the carafe, add coffee or tea (bags or loose leaf) to the filter, put the filter into the carafe of water and let it steep in the refrigerator. All of the components are dishwasher safe. The glass carafe can be used not only for your tea and coffee, but as a wine decanter or to hold other beverages. Several reviewers comment on the attractive styling of the carafe. Brews overnight. Cold brewing tea and coffee requires steeping in the refrigerator for several hours, so you'll need to plan ahead.